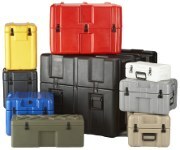 Ameripack Manufacturers and Distributes a complete line of Military Cases including rack mounted, 13414 Cases, waterproof and rotational molded in over 300+ sizes that meet Military Shipping Cases standards and are COTS. Rack mounted military cases allow you to stack cases for transport of your sensitive equipment. These are ideal for military use but can also be applied to any use where you require exceptional protection against vibration, shock or changes in temperature. Our selection of rack mounted cases includes Classic Rack Cases, RADE rack cases and MC rack cases. If you are seaching for US Racks, Shock Racks, Roll X Racks, 19″ Standard Racks or Shallow Roto Racks, we also have those covered. 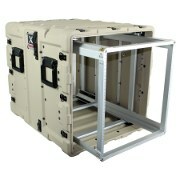 View our line of Miltary cases with rackmounts. For extra sensitive equipment including non-military equipment from digital cameras to aircraft engines, Ameripack specializes in custom foam inserts and panel mounting. We will design your prototype and create your drawings. Custom colors are available. Click here to learn more about Military specs!